In 1937 Grandmasters Wu Kung Yi and Wu Kung Cho, sons of Grandmaster Wu Chien Chuan – the originator of the present-day Wu Family style – moved to Hong Kong from Shanghai and set up the first Academy outside mainland China. Since those early beginnings, Wu Family Style Tai Chi Chuan has flourished and spread around the world, with major centres in Hong Kong, Canada, Singapore and the UK, and many other schools in the USA, Europe and Asia. This hard-cover book contains nearly 300 rarely-seen photographs illustrating the history of Wu style Tai Chi from the earliest days through to 2012, and essays and reminiscences written by some of the greatest exponents of the art. 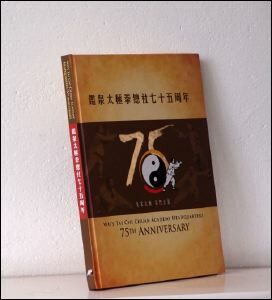 This is a unique opportunity to obtain one of these limited-edition volumes, produced on the occasion of the 75th anniversary of the establishment of the first Wu Family Style Tai Chi Chuan Academy.